Cimprich KA, Cortez D (2008) ATR: an essential regulator of genome integrity. Nat. Rev. Mol. Cell Biol. 9(8), 616–27. van den Heuvel S, Dyson NJ (2008) Conserved functions of the pRB and E2F families. Nat. Rev. Mol. Cell Biol. 9(9), 713–24. Reinhardt HC, Yaffe MB (2009) Kinases that control the cell cycle in response to DNA damage: Chk1, Chk2, and MK2. Curr. Opin. Cell Biol. 21(2), 245–55. 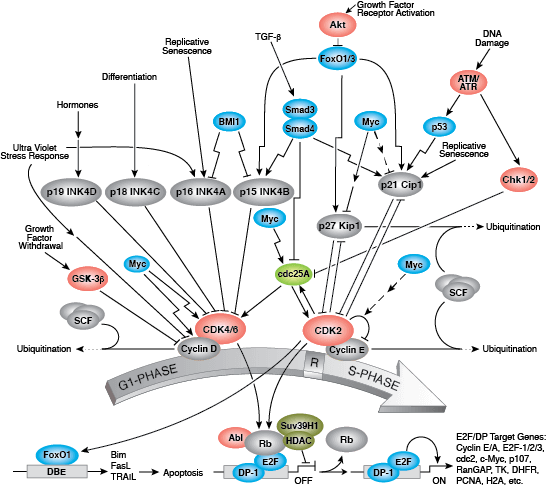 Malumbres M, Barbacid M (2009) Cell cycle, CDKs and cancer: a changing paradigm. Nat. Rev. Cancer 9(3), 153–66. Lindqvist A, RodrÃ­guez-Bravo V, Medema RH (2009) The decision to enter mitosis: feedback and redundancy in the mitotic entry network. J. Cell Biol. 185(2), 193–202. 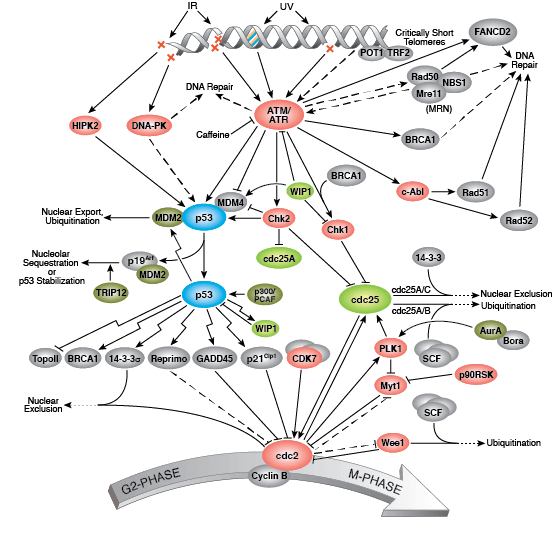 Wohlbold L, Fisher RP (2009) Behind the wheel and under the hood: functions of cyclin-dependent kinases in response to DNA damage. DNA Repair (Amst.) 8(9), 1018–24. Skaar JR, Pagano M (2009) Control of cell growth by the SCF and APC/C ubiquitin ligases. Curr. Opin. Cell Biol. 21(6), 816–24. Kim S, Yu H (2011) Mutual regulation between the spindle checkpoint and APC/C. Semin. Cell Dev. Biol. 22(6), 551–8. Musacchio A (2011) Spindle assembly checkpoint: the third decade. Philos. Trans. R. Soc. Lond., B, Biol. Sci. 366(1584), 3595–604. Lord CJ, Ashworth A (2012) The DNA damage response and cancer therapy. Nature 481(7381), 287–94.